Vicente Tatay Classical Guitar (1930s), made in Valencia, Spain, natural finish, rosewood back and sides, cedar top, black hard shell case. Overall length is 38 3/4 in. (98.4 cm. ), 15 1/8 in. (38.4 cm.) wide at lower bout, and 3 7/8 in. (9.8 cm.) in depth at side, taken at the end block. Scale length is 25 1/2 in. (648 mm.). Width of nut is 2 in. (51 mm.). This guitar is in very fine-playing condition, with an excellent and very traditionally warm sound. There is very little wear overall considering the age of the instrument and only a couple of old repairs. The bridge has been reglued and a few small grain cracks resealed on the back, but there has been no major damage or restoration. Everything appears original except for newer tuners. 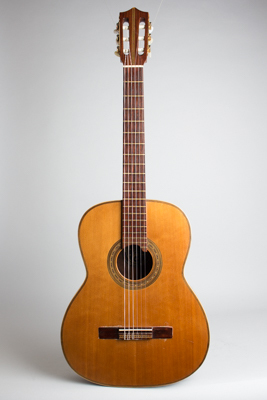 We do not often see authentic Spanish guitars of this type and quality this well-preserved. A very lovely find and a fine-playing instrument. Excellent - Condition.